Okay…so you are a new graduate registered nurse (RN) or a nursing student wondering what type of nursing medical supplies you will need to help you do your job or get through nursing school. Starting a new job or nursing school is always exciting but can be nerve racking at the same time because you have to stress about what type of nursing medical supplies you will need to do the best job and where you can find it at a great deal (because let’s face it you are probably a little strapped on cash after/during nursing school). However, the most important thing you need to know is what exactly you will need. Luckily, I’m a registered nurse (RN) and have gone through exactly what you are going through and I have developed the ultimate list of the medical supplies you will need as a new graduate registered nurse (RN) or nursing student. Also, RegisteredNurseRN.com has become an Amazon.com affiliate so we can bring you great prices on your nursing supplies. Click each link below to find great deals on these recommended products. If you purchase any of these recommended items that are hyperlinked, we get a commission which helps fund this site. Nursing Scrubs! Nursing scrubs aka nursing uniforms are a must have at your new job or for nursing school clinicals. Some jobs and schools require you to wear a certain color. For example at some hospitals, registered nurses (RN) must wear royal blue colored scrubs/uniforms and licensed practical nurses (LPN) must wear teal colors scrubs/uniforms. However, some hospitals allow you to wear whatever you want scrubs wise. I recommend buying nursing scrubs/uniforms by Grey’s Anatomy, Landau, KOI, Cherokee, Baby Phat, and Dickies. These companies tend to make good quality and very comfortable scrubs/uniforms which is so important during your 12 hour shifts. Nursing Lab Coats! Nursing lab coats or jackets are another must have new nurses and nursing students need. When I was in nursing school I was required to buy a white lab coat to wear to clinicals over my scrubs and to professional meetings I had to attend. I actually still have the same lab jacket and wear it to work. It is handy to have because: it keeps me warm, I have more pocket room to stash my pens, alcohol preps, scissors, ekgs pads…etc, and I look more professional. Stethoscopes! It would be an understatement to say stethoscopes are a must have as a new registered nurse graduate or nursing student. In order to do your job as a nurse you must have a stethoscope. It is really unbelievable how much a simple stethoscope will help you determine your patients health status. For example, lung sounds can be heard with your stethoscope. You and I both know how important lung sounds are on a patient. It helps you determine if your patient is in fluid overload (do you hear crackles) or needs to be suctioned (do you hear coarse sounds such as mucus). In order to hear those sounds you need a stethoscope and a good brand too. I recommend going with either Prestige or Littmann. They are the top notch stethoscopes on the market. I personally use a Prestige but many of my colleagues use Littmann and love them. Nursing Shoes! Okay so I said it would be an understatement to say a stethoscope is a must have for new graduate registered nurse RNs and nursing students but seriously nursing shoes are VERY important. I can not stress how important it is you pick a good brand of nursing shoes. Most nurses work 12 hours shifts and you probably already know that during those 12 hours you will be on your feet for about 10-11 hours straight (depending on how crazy your day is). If you do not have comfortable nursing shoes you will have some serious back and leg pain at the end of your shift. I have gone through many pairs of nursing shoes and can tell you that the best shoes for nurses are made by Dankso, NurseMates, Landau, Cherokee, Skechers, and Timberland. I am currently using the Dove White Nurse Mates and love them. I have no leg pain or back pain after my work day. Also, the best place I have found my nursing shoes are at Amazon.com. I can find a pair of $100 nursing shoes for about $40 through Amazon.com. Compression Stockings! So have you heard about nurses getting those dreadful varicose veins from being on their feet for too long? Well it happens! Nursing Compression stockings help prevent them. I can assure you that I have been wearing mine for 2 years now and have not had one varicose vein. I wear the knee high compression stockings but have considered switching to the thigh high for better protection. When you purchase these be sure to get at least 15-20mmHg for the best compression. Anything higher will be uncomfortable and anything lower will be pointless. Also, these support stocking help with circulation and prevent pain associated with being on your feet for so long. I love mine and could not work without them! Blood Pressure Cuffs! 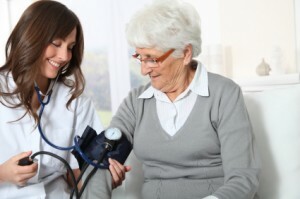 Along with your stethoscope you will need a blood pressure cuff as a nursing student and nurse. Many nurses work in hospitals where blood pressure cuffs are provided and a machine is used to take the patient’s blood pressure but if you are home health nurse or a clinic nurse you may need a blood pressure cuff to take your patient’s blood pressure. I know when I was a nursing student I used my blood pressure cuff all the time. Sometimes companies sell kits where you can get a blood pressure cuff and stethoscope for the price of what one stethoscope would cost. Penlights! I think pen lights are under-used in the nursing profession. They are easy to forget to buy but are so helpful in assessing your patient neuro status. Assessing your patient neuro status with a pen light is just as important as assessing your patient’s lung sounds with a stethoscope. Not only can you use pen lights for assessing neuro status but you can use them to assess your patient mucous membranes. Also, sometimes you will need a pen light when inserting a foley catheter in females to assess for the urethra . So don’t forget the pen light. They are so cheap in price but are so darn handy to have in your pocket! Nursing Scissors! Scissors are definitely a necessity as a new nurse or nursing student. I don’t know how many times I have needed my scissors for opening those difficult medication packages, changing a patients bandage, or other miscellaneous usages. Trust me you will use your dressing scissors a lot. I always carry mine in my scrub pocket because I use them at least 3-5 time during my shift. Also, the fellow nurses I work with always ask to borrow them so believe me they are necessary! I have a cute purple pair made by Prestige. NCLEX Study Guides! If you are a new graduate new who has not taken you NCLEX yet or a nursing student you NEED a NCLEX study guide. I recommend if you are nursing student you need to start studying now even if you are just starting nursing school. I’m here to tell you that I would not have passed my NCLEX first time if I didn’t buy a great NCLEX study guide for my registered nurse RN exam. I used the following books to study for my NCLEX-RN: Kaplan NCLEX-RN Review, Saunders Comprehensive Review for NCLEX-RN, and Evolve HESI Comprehensive Review. Also, be sure to check our my HESI and NCLEX study log I made. I passed NCLEX first try with only 75 questions. And remember, you can always sell your textbook when you are done in most cases, and get most of your money back! So there is no reason not to buy one. Nursing Watch! A watch is another must have as a nurse or nursing student. If you want to be successful at your job or in clinicals you have to know how to time manage. I learned quick as a new nurse graduate how to manage my time and I couldn’t have done it without my handy dandy Timex nursing watch. I bet I look at my watch over 25-40 times during my shift. I use it to time how long I am pushing my IV push drugs or when I need to start antibiotic or premedicate for a blood transfusion. When I first started I made the mistake a buying a cheap $5.00 walmart watch that quit working 2 months into my job. When it quit working of course it was at work and I was lost for rest of the day. So I finally invested in a Timex watch and LOVE it. I have had it for almost 2 years and it works perfectly! Nursing Tote Bags! A nursing tote bag is another essential a new nurse or nursing student needs. Let’s face it….us nurse have a lot of things to carrying to work…from our stethoscopes, name badge, nursing scissors, pens, pen lights, drug books, lunch and other things we need something to carry it all in. A nursing tote bag is the perfect solution. These bags are designed to carry all of this stuff and you can look cute and professional at the same time. I got a nursing tote bag for graduation and would not live without. Nursing Drug Guide! Being a registered nurse entitles you to many responsibilities and giving medications is one of them. As a new graduate nurse you will know what some drugs are but you will not know what all the drugs are you will be giving patients or how they work and what type of side effects you will need to watch for. That is why you will need to buy a pocket drug book guide to help you until you learn your medications. My drug book is awesome and so convenient to use and it gives me the right amount of information I need to do my job. Nursing I.D. Badge Holder! One thing you will have to wear on your nursing uniform/scrubs is your name badge. I recommend buy a name badge holder. It will help keep your badge secure and away from all those wonderful germs it can fall into. Also, many name badge holders are equipped with a retractable badge part for allowing you to scan you badge easily to access those secured areas. They are super handy to have and cost less that $4.00. There you have it….the ultimate list of nursing medical supplies that new nurse graduate registered nurses RN or nursing students will need when starting out in the field of nursing. Be sure to check out our store powered by Amazon.com. Not only can you save a lot of money (since Amazon typically has excellent deals), but every purchase you make through our store helps support our site.